What exactly inspired “4th Time Around” is one of the great Dylan mysteries. The melody and story line are a direct takeoff of the 1965 Beatles song “Norwegian Wood” – among the band’s first songs with a clear Dylan influence. Was the line “I never asked for your crutch, now don’t ask for mine” a warning to stop ripping him off? Dylan’s never said, but three months after he recorded it, he went on a famously stoned limo ride with John Lennon around London and didn’t seem to be harboring any malice. The next year he released John Wesley Harding, which has what appears to be an upside-down image of the Beatles hidden in a tree on the cover – but that’s another mystery. “4th Time Around” was commonly speculated to be a response to The Beatles’ song “Norwegian Wood” – written by John Lennon and Paul McCartney for the 1965 album Rubber Soul – as the two tracks share a reasonably similar melody, lyrical premise, and 3/4 time signature. 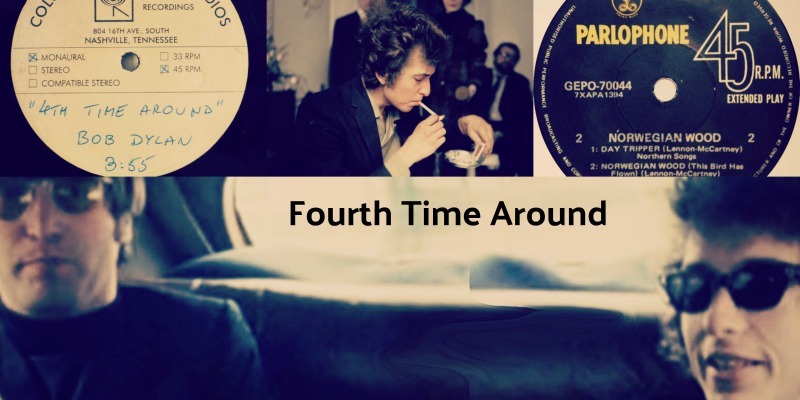 “4th Time Around” has been seen as either a playful homage, or a satirical warning to Lennon about co-opting Dylan’s well-known songwriting devices. Lennon expressed a range of opinions on this topic in interviews between 1970 and 1980. He initially felt it to be a somewhat pointed parody of “Norwegian Wood”, but later he considered Dylan’s effort to be more a playful homage. Still, the last line of “4th Time Around” (“I never asked for your crutch / Now don’t ask for mine.”) played into Lennon’s apparent paranoia about Dylan in 1966–67, when he interpreted this line as a warning not to use Dylan’s songs as a “crutch” for Lennon’s songwriting. 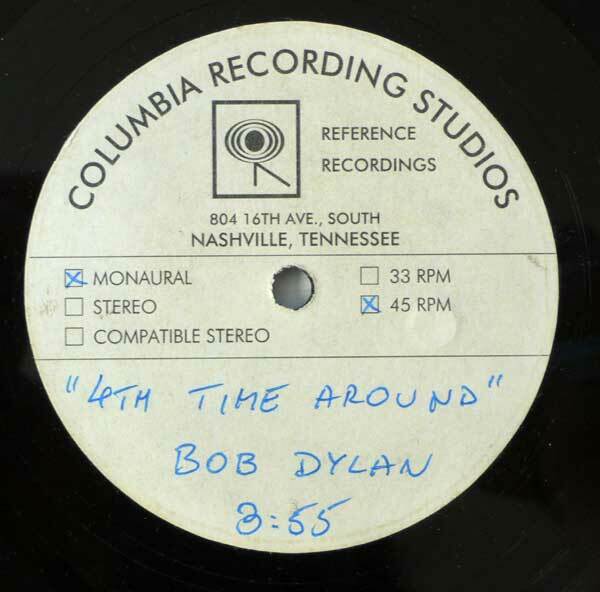 “4th Time Around” was the first song recorded in Nashville. It seems to have been difficult to cut, since it required no less than twenty takes. Al Kooper remembers saying after listening to the cut: “I thought it was very ballsy of Dylan to do ‘4th Time Around.’ I asked him about it— I said, it sounds so much like ‘Norwegian Wood,’ and he said, ‘Well, actually, “Norwegian Wood” sounds a lot like this!’” 24 In 2012 at a conference at Belmont University in Nashville, Kooper explained that when he expressed concern about a possible lawsuit by the Beatles, Dylan told him that the Fab Four’s “Norwegian Wood” was inspired by his song, which he had played for them in private and that, therefore, they would not sue him. ..a minor song on Blonde on Blonde, is more than just a parody of THE BEATLES’ song from a few months earlier, ‘Norwegian Wood’, though there is certainly a strong parallel between that song’s distinctive melody, sung by JOHN LENNON, and the melody Dylan uses. It says something about how these two were perceived that Dylan was suspected (not least by Lennon) of parodying, rather than copying, the Beatles. Years later, when GEORGE HARRISON was asked in an interview about the way that the Beatles and Dylan had influenced each other, he seemed to suggest that ‘4th Time Around’ wasabout ‘Norwegian Wood’, and about how that song had been inspired by Dylan in the first place..
Dylan’s song “Fourth Time Around” (from Blonde on Blonde, February 1966) and its relationship to the Beatles’ “Norwegian Wood” (from Rubber Soul, December 1965) are fairly well known but worth mentioning in the larger context of Dylan’s thefts and intertexts. 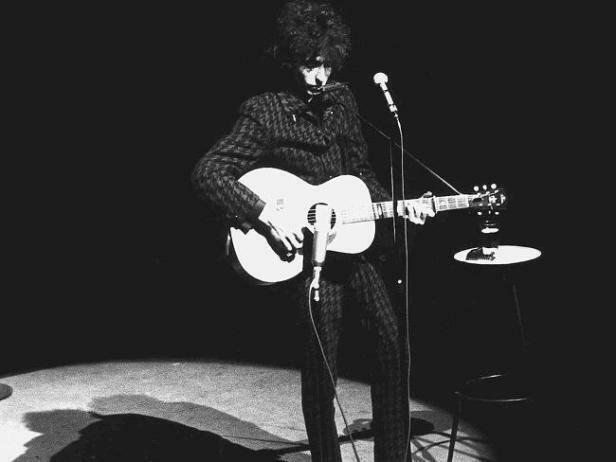 The song has been described as “Bob Dylan impersonating John Lennon impersonating Bob Dylan,” but it is also a song in which Dylan triumphs in the battle that he wages with Lennon. When you listen to “Fourth Time Around” and then go back to “Norwegian Wood,” the Beatles song sounds coy, almost innocent in comparison to the sophistication of Dylan’s voice and lyrics on the classic 1966 album. It is hard to imagine Dylan actually singing this to Lennon, which he apparently did, and it is very easy to believe reports of Lennon being unhappy at what must have seemed like mockery and parody. Dylan outdoes, accentuates, overloads the rhymes, and on one level does parody the simple rhyme of the Beatles song. I’ve probably listened to it 50, 60 times trying to figure out exactly what’s going on. The melody is really similar to Norwegian Wood and I love the repetitive classical guitar lick, the machine-gun drumbeat, and the bass line that just keeps driving and driving. Dylan can talk about real emotions and then go way off and say something completely aesthetic. The end result is this really rich, interesting piece that you can dig into forever. This one’s kind of a warning. The new girlfriend is being told how it ended with the last one, and if you’re not careful. .. That line is really hard: ‘I never asked for your crutch/ Now don’t ask for mine.’ Or maybe it really is about The Beatles after all! *Dylan’s first performance of FTA in 1999 was @ Oporto, Portugal – 8 April 1999. When he revisited the song in concert in the 1990s the melody line he chose showed just how close to ‘Norwegian Wood’ the song really was. He gave an especially fine performance at the first of his two concerts in Portsmouth, England, on Sep- tember 24, 2000. I love this song. The lyrics really intrigue me. It is a lot better than Norwegian Wood.